Are you looking for a family friendly holiday in the UK? Do you want to be somewhere where you know your children can play safely while you are relaxing? Party Houses have the perfect solution for you, with our beautiful houses in your own private area in different areas around the UK. Look at our Party Houses to rent in the Midlands and the Peak district, Wales, South West or South East. Or if you want to be inspired, take a look at the entire selection of our Party Houses. As taking the kids on holiday can be joyful, but sometimes just a little bit stressful., we at Party Houses, have a number of little touches to help you enjoy great family friendly accommodation. If you’re staying in the Midlands and the Peak District, there is a lovely (and free of charge) playground for the children at Tittesworth Water, and another at Buxton Pavillion Gradens. Additionally RSPB Coombes Valley Nature Reserve is also local and free. They have Trails, picnic areas and often have children’s events on. Another free attraction (though a little further away) is the National Memorial Arboretum at Alwras (near Lichfield), which is beautiful in itself. To entertain the children there are TV’s, DVD players, and a variety of children’s books. Many Party Houses have games rooms with table football or table tennis (more details can be found on the individual house accommodation pages). On top of this our houses are surrounded by picturesque fields to run around and let off some steam, weather permitting of course! For practical purposes we can provide eg baby baths, cots, and small steps so the little ones can reach the bathroom sinks to clean their teeth etc. There are several other family attractions: Gulliver’s Theme Park at Matlock Bath, over 60 rides complete with Nerf Zone, Dinosaur Kingdom and Spy Zone. The Heights of Abraham also at Matlock – Cable cars, caverns to explore, playgrounds, fossil factory, restaurants, gift shop and fabulous walks and views. Go Ape at Buxton Country Park Different activities for different ages. Go Ape Tree Top Adventure age 10 + years, over 1.4 m tall. Tree Top Junior aimed at 6 – 12 Year olds over 1m tall. Waterworld flumes and swimming fun in the Potteries on Festival Park. Chatsworth Farmyard and Adventure Playground at Chatsworth House, Bakewell, Derbyshire. Open generally from Spring through to December there are milking Demonstrations, Farmyard animals, small animal handling, and trailer rides; plus a great adventure playground and climbing forest. There is also a lot to do locally, for example Alton Towers and Peak Wildlife Park are both within a short drive of your Party House. For more ideas when planning your visit, check out our Activities and Ideas page, which is full of information about local attractions and events. Have just returned from 3 nights at Roaches Hall, stunning location and the house is set out well to cater for a large group. Such a lovely location, you can set off for walks without using the car and the views from the house are gorgeous. The loation is perfect – make as much noise as you like without disturbing anybody but when the music is off, it is so peacefull you will sleep like a log! Just returned from a fabulous break at roaches hall. We are musicians,and wanted a venue where we could write and relax whilst enjoying the wonderful views. Roaches hall is set in the most beautiful and atmospheric surroundings,And we found this most conducive for creating and playing our music.What a wonderful place! Hamps hall and barn are perfect locations for special celebrations. I recently attended a party at Hamps Hall and Barn and it couldn’t have turned out any better. It was one of the best parties I have been to. It was so great to be able to be in the same location with 40 friends and the layout is perfect for everyone to have their own space if needed and everyone to be together when wanted. I am wife and a gang of university friends stayed at roaches hall. If was very relaxing time in the middle of the Peak District. Lots of things to do nearby.The kitchen was good but the grill pan did not like grilling bacon so i fried. Well worth the long journey to get here! Ideally situated, cannot fault it! We hired Chels and Toft Barns for a colleagues retirement party for a weekend. 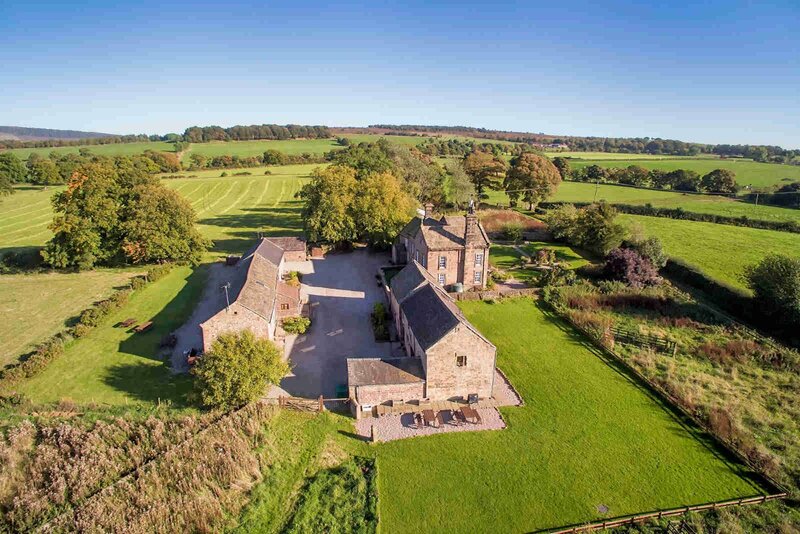 The surroundings are perfect, situated on the edge of the Peak District with so much on offer it’s more a case of narrowing it down to fit it all in. With so much space, the rooms are only used for sleeping in, the living rooms are well equipped and comfortable and a huge dining room enabled The Dinner Party Company to cook us all a terrific meal on Saturday night (also extremely highly rated – well priced and superb food) so we could celebrate together in private. The Royal Oak pub was also very welcoming and gave some a lift home – there’s service.